My love for a post apocalyptic zombie game could not be quench by my latest Zombie game review, Zombies ate my Pizza. So to save the day I bring three of the top brains eating monsters that caught my eyes. If you like Zombie ate my pizza, you will love Age of zombie because they are both pretty similar. You walk around shooting zombies, mummies and ninjas until you get to a boss were everything go crazy. Grab your shotgun and hop on you T-Rex to stop the evil professor Brain in action pack Army of darkness inspired game. 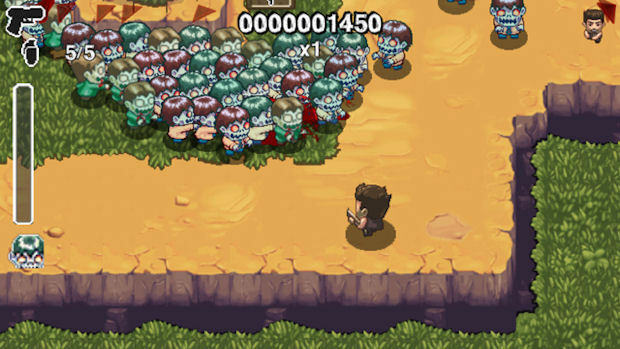 Tired of shooting zombie, let yourself get bite and join the zombie city. 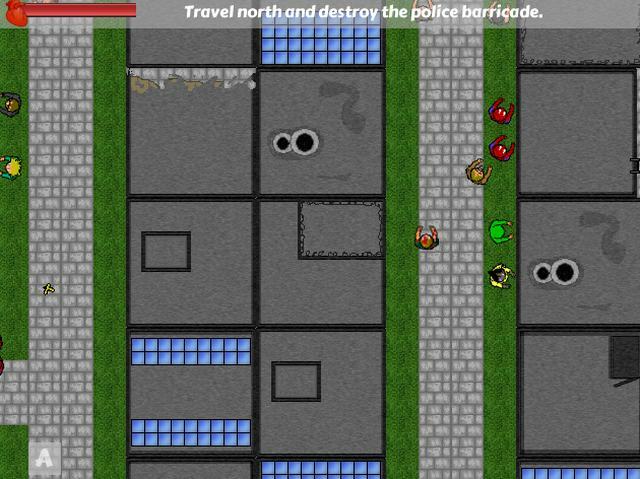 You play as a Zombie and must take over the city by converting other human, sending the hordes of zombie take out the police or even the army. Touching (bitting ?) 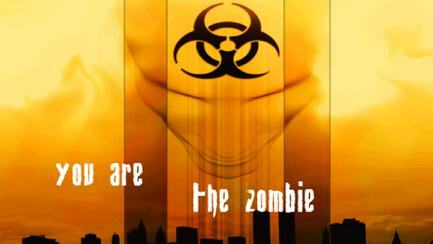 people or the policemen they themselves turn into Zombies. It’s a fun action top down game, but it is in very early stages and doesn’t seem to go any further than going east after taking out the town hall full of soldier. The last but not the least Confederate Express is unlike the other. This game is a kickstarter project and should be release soon. In the near future technology has finally granted humanity with the immortality through the use of a computer chip. Unfortunately something has gone wrong, and those who do somehow die stay alive as zombies due to a malfunction of the chip. You are part of the Confederate Express and your main objective is to deliver a package and you are presented with multiple options of deliverable goods, so choose carefully: if you bite more than your crew can chew – it may result in an inevitable death, forcing you to start over. It’s too late to back the project, but you can pre-order the game if you want to support them. Or check the project Kickstarter Page. I’ve found a interesting find, Lootcrate, a monthly service that send you geeky goodies every month. It’s well explain on the site but let me explain it to you. There is even a chance to win mega crate. So enjoy you never know what will end up in your crate. Since you have only a limited number of normal heroes you want to make sure that you make the most of the ones you have. Not all your cities need governors and if you don’t have epic heroes it will be better to keep most of your heroes together so you can duel with them easier and treat them with a nice banquet. Having your governors at level 100 will give your cities the best production bonus. If you have Epics or heroes with skillbooks that boost food production, you want to make sure that they are in the important cities with your governors. They do not have to be governor for you to get the bonus but only the highest bonus from a hero applies in a city. So which cities should have governors? Your Main city obviously should always have a governor. If you have any County or State capitals they should also have a governor. Your capital outpost and any 15c should be good candidate because they will produce more food. Other way to increase the output of your governor ? Go in your civil and assign them to positions that increase their politics. Equip them with equipment that raise their level. Raise their level, add skillbook with the farm skill. What equipment should your governor have ? The basic minimum your governors should have is a Cloud helm and Welfare of the People equipped and are assigned positions that increase their politics. If you don’t have welfare of People in hand you can always use a Cloud enforced lance which usually increase politic too. What skill and skill books make good governor ? At level 50 some epic heroes get a farm skill that give up to 25% food output. 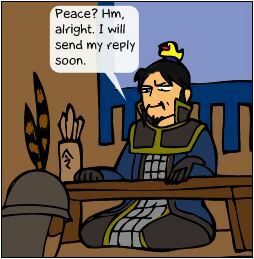 Sun Quan, Liu Bei, Cao Cao and Zhou Yu all have a 25 % Farm bonus while Zhang Cheng (from the hermit house) have only a 9% bonus. You can give skill book that have the Farm skill, this will increase your output too. Note that the farm skill from the heroes level 50 bonus and the skillbook stack together but if 2 heroes have the heroes level 50 skill only the best bonus from both heroes will be taken, same thing go from skill book. 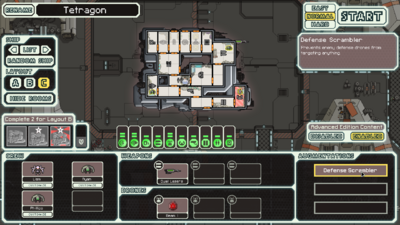 Engi cruiser is the easiest ship to get, you just need to get to sector 5 and you’ll get it. Is achievement are easier than the Kestrel, so you will probably end up unlocking the type B with the Engi cruiser before the Kestrel. Finishing the game with it unlock the Federation Cruiser. Unlock: Reaching the fifth sector with any Kestrel layout will unlocks the Engi Cruiser. The Torus can be hard at first to play and you will rely mostly on your anti-ship drone to do damage to enemies ship at the beginning. The Ion Blast II is one of the great weapon of the game it’s fast recharge rate make it perfect to take down most shield with constant firing. Combine with laser & beam later your ship will be a force to recon with and will minimize your drone part usage. Doors are probably a necessary upgrade on this ship because of the Engi weakness in hand-to-hand combat unless you have the opportunity to get Rock or Mantis crew, do so. Mind control can be a nice system to add to compensate Engi weakness in combat. Hacking could be a nice addition but it unfortunately use drone part too unless you have Drone Recovery Arm augment. The Teleporter is not advised on this ship, unless you are getting the system for blue storyline options. Cloaking is always a great add, since it help dodge those nasty final attack of the Rebel flagship. The Wiki have an interesting side note about how to level up the skill of your crew on this ship. In the first few sector you will probably encounter ship that can’t do anything to your ship so you can take advantage of that and level up your weapon, shield, piloting and engine since the ion blast is a non-lethal weapon. Having these skill max will be huge later and will make it easier for you to spend your scrap on other systems. Unlock : Earning two of the three Engi Cruiser achievements will unlock Layout B.
I have to be honest with you, I really have a hard time with this ship. It’s decent enough to cover you base the first 2 sector, but it has a lot of flaw. Heavy Ion + Heavy Laser I combo cover you base until you hit a ship with 2 shield, even before that the Heavy Ion is so slow to fill that the enemy might be able to hit your weapon before you even fire. Upgrade to a better ion weapon quickly or complement it with bomb/missile since it won’t do it for ship with heavy shield. Starting with only one crew is one of them, it’s make you pretty vulnerable to boarding and event that might kill your only crew. 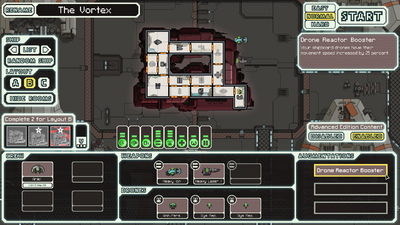 Once you upgrade the doors the Anti-Personnel Drone can handle the hostile boarders on the ship while you empty the oxygen out of every room except the medbay and helm. The initial drone and augment will get useless pretty quickly since you probably want to fill this ship with anti-ship drone and defense drone instead of repair drone, and have a crew instead of just one lonely guy. The only thing I can say that good about this ship is that the layout is somewhat good, easy to go around and system that go well together are next to each other like the teleporter and medbay which might make it a decent boarding ship if you get the right crew. There not much empty room though, so each hit will probably damage something important. If you want a challenge that ship is for you, you can do a decent job if you get lucky but I get real hard fast if you don’t get lucky with your drops and shops. Unlock: Reaching Sector 8 with the Engi Cruiser Layout B and Advanced Mode enabled unlocks layout C.
The ship layout is pretty neat but the main problem of this ship its is constant use of drone part by the hacking system and Beam Drone. If you can get your hand on the drone recovery arm you might save a lot on drone part there. Later, this ship will mostly relies on it’s hacking and massive drone army to destroy the enemy ship. The Defense Scrambler will takes care of those nasty Anti-Combat drones and defense drone so you shouldn’t have problem deploying offensive drone and you could add missile weapon to be able to target specific systems that are causing you trouble. Drones destroy Zoltan shields pretty easily so that not an issue here. Mind Control, Teleportation can be nice addition to this ship too since your Lanius is a pretty good boarder specially if you can get another Lanius crew. This is a follow up of the latest Nobility post, this one is mostly base on the in game guide. These are special titles. Only one title is available on each server. 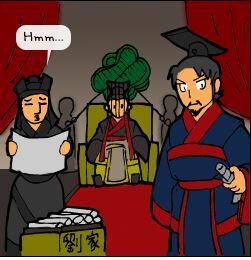 These titles are the ultimate honor in the world of Three Kingdoms. Once a player has taken control of the Imperial Capital and 4 State Capitals, has more than 2,234,400 Contribution Value points, and the State Capital has opened for more than 30 days, then the player will be allowed to build an Imperial Palace in the Imperial Capital. When the Palace reaches level 5, you will under attack by NPC troops every time when you upgrade it. There will be a final wave of troops attacking when your Palace reaches level 20. 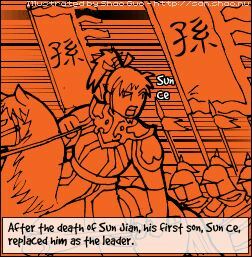 If you survive in these attacks, you will get the title of Emperor. Attack and Defense value of troops is increased by 15%. If you have 1,396,500 Contribution Value points or more, when you occupy the Imperial Capital, you will gain the title of Prime Minister. If lose control of the Imperial Capital, or one of your 2 State Capitals, you will lose the title as well. 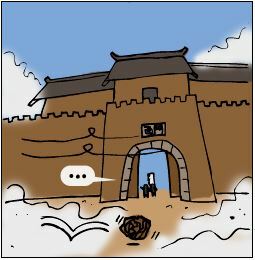 Player who occupies Pu-yang, the State Capital of Yan, and increase their Contribution Value to at least 1,396,500 to become the Lord of Wei. Bonus: Attack and Defense value of troops increase by 15%. 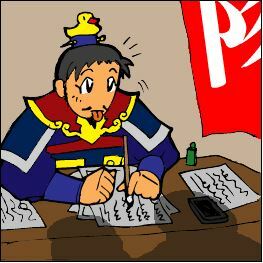 Player who occupies Cheng-du, the State Capital of Yi, and increase their Contribution Value to at least 1,396,500 to become Lord of Shu. 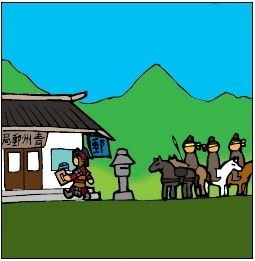 Player who occupies Jian-ye, the State Capital of Yang, and increase their Contribution Value to at least 1,396,500. 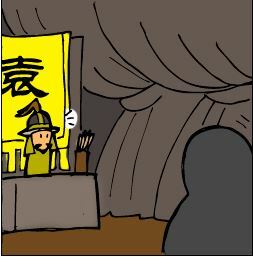 The Lord of Qin is a noble rank which players can fight for once the server starts. 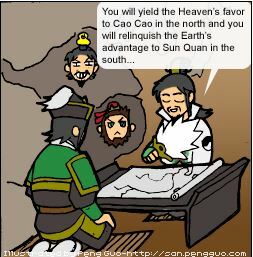 The player with the highest Contribution Value over 2,234,400, will gain the title of Lord of Qin. 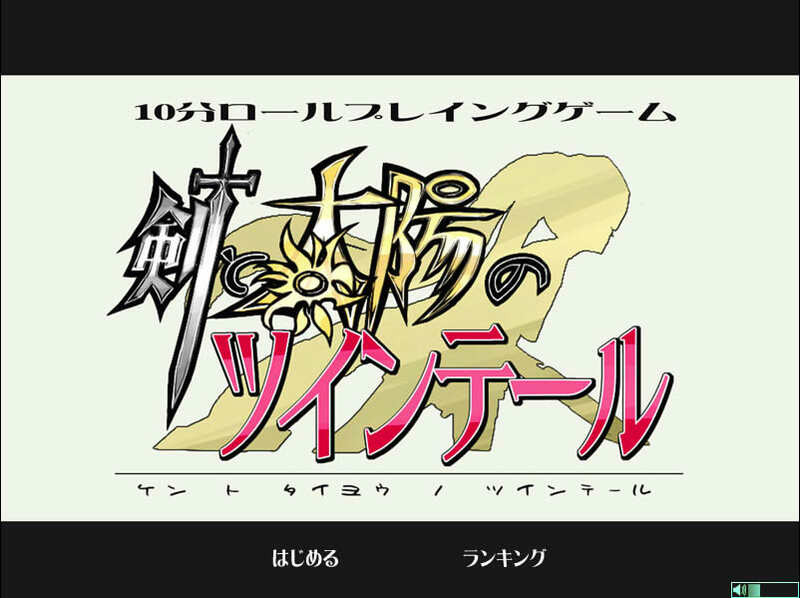 This title will be re-calculated at 24:00 every Saturday, and will not change for a week. You can appoint a office position for each hero of yours. The position can increase his status. There are 4 types of positions, each can increase one of their status. You must have certain nobility to appoint the corresponding position. Another request is your hero should reach a certain level.